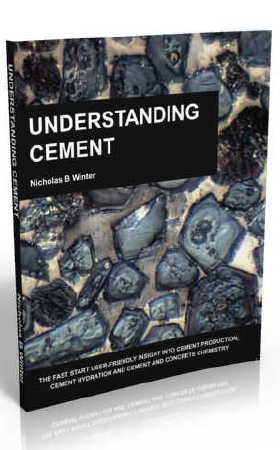 I'm often asked: "Does cement react with glass?" Yes, it does, it results in asr. 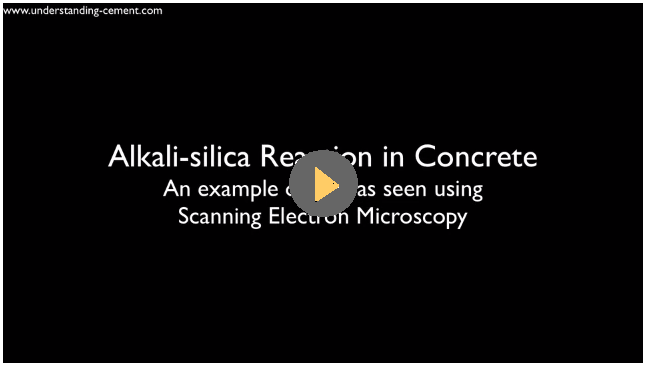 Well, even as a blog post, maybe that's a bit brief so let's do an experiment to demonstrate alkali-silica reaction. 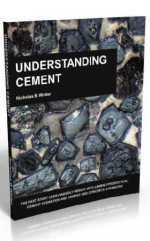 Firstly, fly ash and slag are largely composed of glass; obviously, these react with Portland cement as that is the purpose of adding them to the concrete mix. However, the question is usually asked in the context of "normal" glass, as used in bottles and windows. 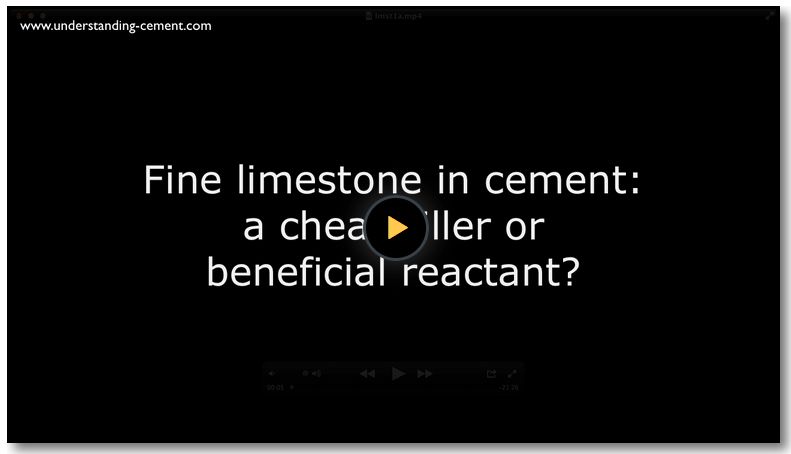 Of course, as most people involved with cement know, the answer is still "yes". If in doubt, look for sodium hydroxide or potassium hydroxide solutions in a laboratory; they will be (or should be) kept in plastic bottles, not glass, because they react with glass and etch it. Sodium and potassium hydroxide are what make cement pore fluid strongly alkaline, so by analogy with laboratory chemical containers, one might reasonably conclude that cement pore fluid will react with glass, even without doing any experiments. Just for fun, I did an experiment anyway to demonstrate that asr occurs. 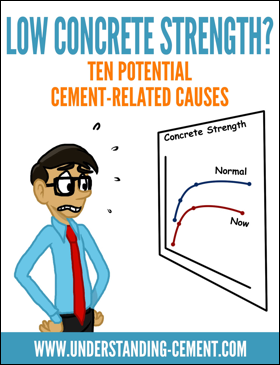 I mixed up some Portland cement paste at a water-cement ratio of 0.4. The w/c isn't critical, but if the paste is very porous due to a high w/c ratio, the gel will have somewhere to go and may not crack the glass as easily. OK - back to the experiment. I filled a small glass container with the paste and sealed the end. I re-opened the container after a day or two and added a couple of drops of water to make sure the paste didn't dry out and that any gel that formed had water available to absorb. Then I waited maybe a couple of months - I'm not sure exactly how long it took to crack the glass as I didn't look at it every day. The time taken to crack the glass - assuming it does crack - will depend mainly on the alkali content of the cement but the dimensions of the container may have some effect too. One day, I saw that the glass container was cracked extensively (Figure 1). Figure 1 After about two months, the cement pore fluid had reacted with the glass to produce an alkali silicate gel - asr; the gel had expanded and cracked the glass. 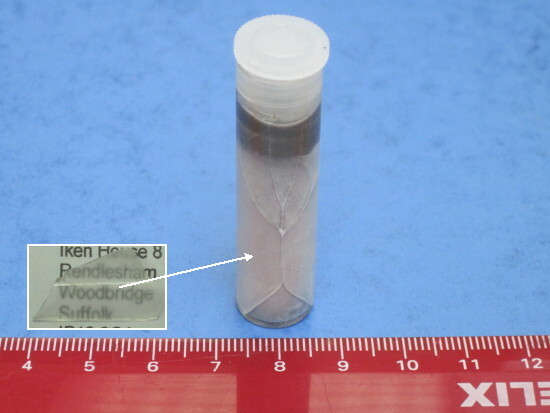 The insert in Figure 1 shows a piece of the glass after it was detached from the paste; the surface is strongly etched, with the printing below only just readable. The beautifully symmetrical crack pattern in the glass tube presumably shows something about how the stress in the glass was relieved. In case anyone should doubt it, it also shows this was a genuine experiment and not a "fix" - I reckon this crack pattern could only be induced by a slowly-developing internal expansive force. You might say that this is all supposition, and not proof that the glass has reacted or that asr had occurred. 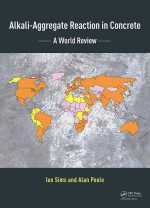 OK, have a look at Figures 2-5. 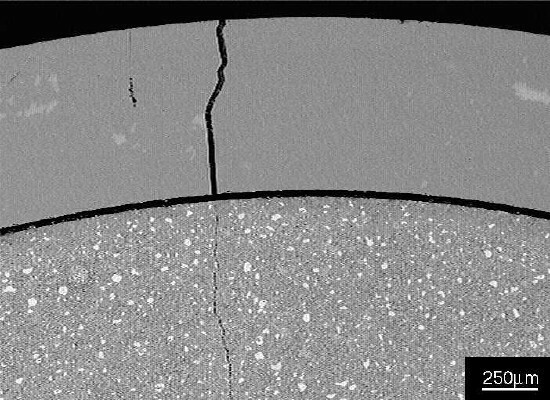 These show SEM images of a polished section I made through the cement paste and the glass, and an X-ray spectrum of the gel. 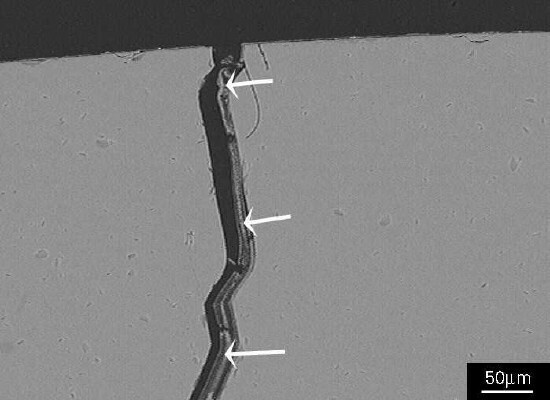 Figure 2 Part of glass tube and cement paste, showing a gap between the paste and tube, and a crack in the tube wall that extends into the paste. Black areas in the image in Figure 2 are epoxy resin used to prepare the polished section. Figure 3 Residual alkali silicate gel can just be seen adhering to the glass surfaces (arrowed). 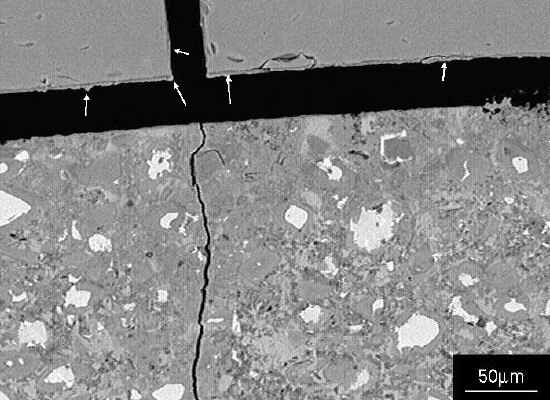 Figure 4 SEM image showing a detail of the crack in Figure 2; the crack contains alkali silicate gel (arrowed). 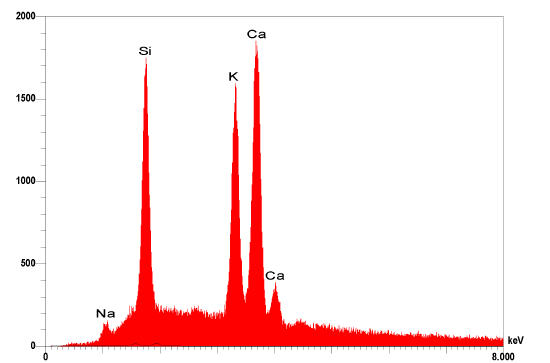 Figure 5 X-ray spectrum of gel in crack in Figure 4, showing strong peaks due to calcium, potassium and silicon, and a weaker peak due to sodium. The X-ray spectrum in Figure 5 is characteristic - proof that asr has occurred. (Note: the X-ray detector was a standard detector with a beryllium window that absorbs low energy X-rays, so no peaks are shown due to oxygen and other light elements). The calcium, potassium and sodium were provided principally by the cement, and the silicon by the glass. (The glass was composed mainly of silica, but also some lime, soda and potash - some of this probably found its way into the gel too.) The gel was generated at the interface between the paste and glass, then extruded into the crack when the glass fractured due to the expansive forces applied by the expanding gel. The results of this experiment would probably be similar with most commercial glass. Borosilicate glass (eg: Pyrex), for example, is used as a test reactive aggregate in asr studies. So, if you are doing building work and get wet cement onto a glass window pane, it will etch the glass unless cleaned off. Similarly, when doing experiments with cement paste (or concrete or mortar), it isn't really a good idea to use glass containers - not unless you want to induce asr, of course.